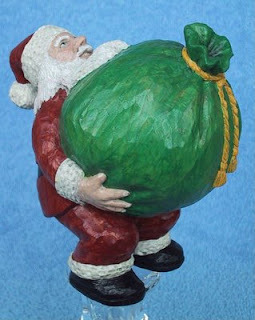 These are hand carved Santa's donated by artist Marilyn Meuret. Raffle tickets were sold at the Rio Rancho Arts and Crafts Fair on November 22nd at the Sabana Grande Recreation Center. Marilyn's hand carved work is intricate, full of life and character and well executed. I dont' know if you've ever tried your hand at carving something from wood with hand tools. It is not an easy task in coaxing life out of a block of wood and translating it into something warm and humorous as Marilyn does. And, she does it well! 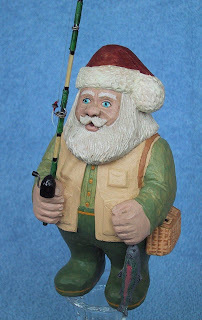 So, YOU can be the proud owner of one or both of these wonderful Santas. Just purchase one or many raffle tickets. Proceeds for this raffle will go towards building the Education/Scholarship Fund for RRAA. It is part of our community outreach effort (artists reaching out through art).